FAITH LAPIDUS: Welcome to THE MAKING OF A NATION -- American history in VOA Special English. The eighteen eighties were years of important change in American business and industry. Twenty years after the Civil War, the Unitedbl States had become one of the leading industrial nations of the world. As the number of factories increased, so did competition between businesses. Some industrialists cooperated with their competitors to reduce competition. But this did not always succeed. There was no legal way to enforce their agreements. This week in our series, Leo Scully and Jack Weitzel tell how these issues were handled during the administration of President Benjamin Harrison. LEO SCULLY: In eighteen seventy-nine, a new form of business organization was developed -- the trust. In a trust, stock owners of many competing companies give control of their stock to a committee, or group, of trustees. The trustees operate all the companies as one and pay profits to the stockholders. The profits would be high, because there would be no competition to drive down prices. One of the first trusts was formed by John D. Rockefeller in the oil industry. 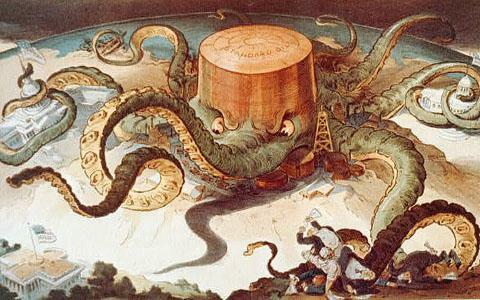 The stockholders of seventy-seven oil companies gave control of their stock to nine trustees of Rockefeller's Standard Oil Company. The nine men controlled ninety per cent of the nation's oil production. JACK WEITZEL: The success of the Standard Oil Company led to the creation of trusts in other industries. Soon there was a sugar trust, a salt trust, a steel trust, even a whisky trust. These huge corporations represented hundreds of millions of dollars. This great wealth made them very powerful. Former President [Grover] Cleveland, himself a friend of business, warned of a growing danger. "Corporations," he said, "should be carefully-controlled creatures of the law and servants of the people. Instead, they are fast becoming the people's masters." LEO SCULLY: The public began to demand government controls of the trusts. Farmers claimed that prices were too high, and they blamed the trusts. Workers said their unions could not negotiate with the new industrial giants. Small businessmen charged that trusts were too powerful. They said the trusts could destroy them. Public demands for action led the governments of fifteen states to pass anti-trust laws. But the state laws could do nothing. Most of the trusts were nationwide corporations which did business in many states. Public protest was so great that both parties in the eighteen eighty-eight elections promised to pass a federal law against trusts. JACK WEITZEL: A number of such bills were proposed. One offered by Senator John Sherman, a Republican, was approved by Congress. President Benjamin Harrison signed it into law in eighteen ninety. The Sherman Anti-trust Law sounded severe. It said it was illegal for a trust or any other organization to interfere with interstate commerce -- trade among the states. It was also illegal for any person or organization to form a monopoly -- to get control of a whole industry. The law ordered harsh punishment for any person found guilty of these crimes. It sounded like a strong law. But it was not. It was written in a very general way that left the courts to decide what the law really said. Opponents of the Sherman Anti-Trust Bill said its purpose was not to destroy trusts, but to make the public believe that trusts would be destroyed. LEO SCULLY: During President Harrison's administration, only eight corporations were accused of violating the new anti-trust law. Of the eight, only one was found guilty, and only in a very limited way. The first company charged was the Whisky Trust. A court dismissed the case. It said the government failed to prove that the trust had interfered with interstate commerce. A few years later, the government asked the courts to break up the huge sugar trust which controlled ninety-eight percent of the sugar-producing industry. The Supreme Court refused to do so. It said that it was true the trust had formed a monopoly in the sugar-producing industry. But it said the monopoly was in manufacturing -- not in trade or interstate commerce. Therefore, said the high court, the sugar trust was legal and did not violate the anti-trust law. JACK WEITZEL: Industrial trusts helped to reduce competition among American companies. High tariffs also gave some protection from competition with foreign companies. But business leaders were not satisfied. They demanded even higher taxes on imports to further reduce competition. So, Republican Congressman William McKinley of Ohio proposed a new tariff bill -- one that would raise import taxes higher than ever before. The tax already was about thirty-eight percent on most imported products. The new measure would raise it to almost fifty percent. LEO SCULLY: Not everyone in the Harrison administration supported the high tariff measure. Secretary of State [James] Blaine wanted to increase trade between the United States and other countries. He warned that new, high tariffs would destroy those plans. 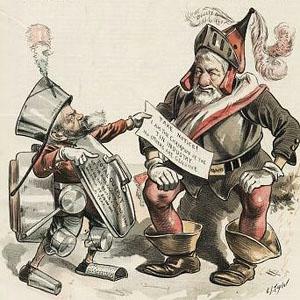 A cartoon from Puck magazine makes fun of President Harrison, left, for his support of a tariff on tin. Secretary of State James Blaine is at right. Blaine also opposed the bill because he felt it would hurt the Republican Party politically. In a letter to Congressman McKinley, Blaine said the bill would anger the farmers by adding as much as eight percent to the price of shoes for their children. "Such movements as this for protection," said Blaine, "will move the Republican Party only into speedy defeat." JACK WEITZEL: Most western and southern congressmen opposed the tariff bill, because it would mean higher prices to the people of their states. But the bill could not pass without the support of some of them. So, supporters of the tariff bill offered a deal. If westerners voted for the tariff measure, then eastern lawmakers would support a silver purchase bill that the westerners wanted. The bill, known as the Sherman Silver Purchase Act, would have the government buy four-and-one-half-million ounces of silver each month. The government would pay for the silver with paper money -- treasury notes -- which could be exchanged for gold or silver money. LEO SCULLY: Western mines were producing huge amounts of silver. By selling it to the government, the mining interests hoped to keep the price of silver from falling. Western interests spoke in Congress now with a much stronger voice. In eighteen eighty-nine and eighteen ninety, six western territories became states. This added twelve more western representatives in the Senate and others in the House. The deal was agreed to. Both the McKinley Tariff Bill and the Sherman Silver Purchase Bill were approved by Congress and signed by President Harrison. As expected, the price of imported goods rose. And the people blamed the Republicans. JACK WEITZEL: In the congressional elections of eighteen ninety, the Republican Party suffered heavy losses. The Republican majority in the Senate was cut to eight. And not all the Republican senators would support the party on every issue. The Republicans lost control in the House of Representatives. Only eighty-eight were elected to House seats. Democrats elected two hundred thirty-five Representatives. Voters also elected nine House members and two Senators from a new political organization -- the People's Party. 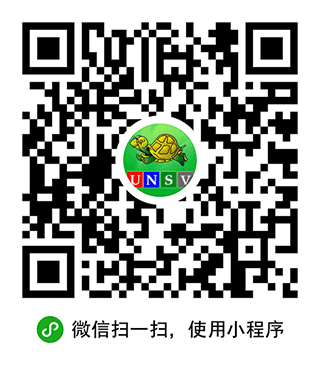 The new party was born in farming areas of the West and South. It was a party of protest, formed by men who refused to support either of the two old parties. LEO SCULLY: Years before, farmers had united in agricultural organizations they called granges. A national grange had been formed. During hard times, the grange organized political action groups to help elect officials who were friendly to farmers. But as farm conditions improved, the Granges began to disappear. A few years later, farmers began to build new organizations. Like the granges, they began as social and economic groups. By the late eighteen eighties, many of these groups had united into two large organizations. One, with more than one million members, was the Southern Alliance. The other, with fewer members, was the National Farmers' Alliance. Members of the two groups began to unite for political action. That will be our story on the next program of THE MAKING OF A NATION. FAITH LAPIDUS: Our program was written by Frank Beardsley. The narrators were Leo Scully and Jack Weitzel. You can find our series online with transcripts, MP3s, podcasts and images at www.unsv.com. You can also follow us on Facebook and Twitter at VOA Learning English. Join us again next week for THE MAKING OF A NATION -- an American history series in VOA Special English.